Ducks are birds in the family Anatidae. Ducks are closely related to swans and geese, which are in the same family. The main difference is that ducks have shorter necks, and are smaller. Ducks lay eggs once a year and are omnivorous, eating aquatic plants and tiny animals. Dabbling ducks feed on the surface of water or on land, or as deep as they can reach by up-ending without completely submerging. Along the edge of the beak there is a comb-like structure called a pecten. This strains the water squirting from the side of the beak and traps any food. The pecten is also used to preen feathers. Diving ducks dive deep to get their food. Many ducks are migratory. This means that they spend the summer months in a different place than the winter months. Ducks show a cosmopolitan distribution, they can be found all over the world, except for Antarctica. Some duck species live on the South Georgia and Auckland Islands, which are subantarctic. Many species have established themselves on remote islands, such as Kerguelen or Hawaii. Some ducks are bred and kept by humans. They are not wild ducks. They are kept to provide food (meat and eggs), or to use their feathers for pillows and other items in the house. Especially in Asia, many people like to eat duck. Ducks are sometimes kept as pets. They are often kept by groups of people on public ponds for their beauty and calming nature. People commonly feed ducks in ponds stale bread, thinking that the ducks will like to have something to eat. However bread is not healthy for ducks and can kill them. Dabbling ducks feed on the surface of water or on land, or as deep as they can reach by up-ending without completely submerging. Along the edge of the beak, there is a comb-like structure called a pecten. This strains the water squirting from the side of the beak and traps any food. The pecten is also used to preen feathers and to hold slippery food items. A few specialized species such as the mergansers are adapted to catch and swallow large fish. The others have the characteristic wide flat beak adapted to dredging-type jobs such as pulling up waterweed, pulling worms and small molluscs out of mud, searching for insect larvae, and bulk jobs such as dredging out, holding, turning head first, and swallowing a squirming frog. To avoid injury when digging into sediment it has no cere, but the nostrils come out through hard horn. The Guardian (British newspaper) published an article advising that ducks should not be fed with bread because it damages the health of the ducks and pollutes waterways. Ducks are generally monogamous, although these bonds usually last only a single year. Larger species and the more sedentary species (like fast river specialists) tend to have pair-bonds that last numerous years. Most duck species breed once a year, choosing to do so in favourable conditions (spring/summer or wet seasons). Ducks also tend to make a nest before breeding, and, after hatching, lead their ducklings to water. Mother ducks are very caring and protective of their young, but may abandon some of their ducklings if they are physically stuck in an area they cannot get out of (such as nesting in an enclosed courtyard) or are not prospering due to genetic defects or sickness brought about by hypothermia, starvation, or disease. 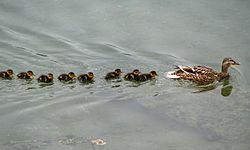 Ducklings can also be orphaned by inconsistent late hatching where a few eggs hatch after the mother has abandoned the nest and led her ducklings to water. 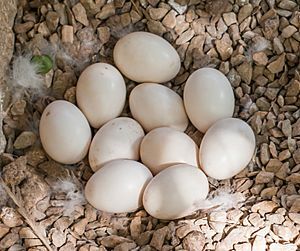 Most domestic ducks neglect their eggs and ducklings, and their eggs must be hatched under a broody hen or artificially. Male and female mallard ducks courting on the Hudson River. The male is the one with the green head. 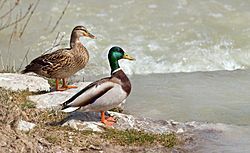 Female mallard ducks make the classic "quack" sound while males make a similar but raspier sound that is sometimes written as "breeeeze", but despite widespread misconceptions, most species of duck do not "quack". In general, ducks make a wide range of calls, ranging from whistles, cooing, yodels and grunts. For example, the scaup – which are diving ducks – make a noise like "scaup" (hence their name). Calls may be loud displaying calls or quieter contact calls. A common urban legend claims that duck quacks do not echo; however, this has been proven to be false. This myth was first debunked by the Acoustics Research Centre at the University of Salford in 2003 as part of the British Association's Festival of Science. It was also debunked in one of the earlier episodes of the popular Discovery Channel television show MythBusters. The ducks have a cosmopolitan distribution. A number of species manage to live on sub-Antarctic islands like South Georgia and the Auckland Islands. 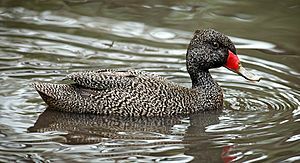 Numerous ducks have managed to establish themselves on oceanic islands such as Hawaii, New Zealand and Kerguelen, although many of these species and populations are threatened or have become extinct. 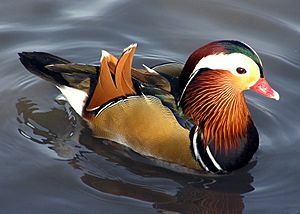 Some duck species, mainly those breeding in the temperate and Arctic Northern Hemisphere, are migratory; those in the tropics, however, are generally not. Some ducks, particularly in Australia where rainfall is patchy and erratic, are nomadic, seeking out the temporary lakes and pools that form after localised heavy rain. Worldwide, ducks have many predators. 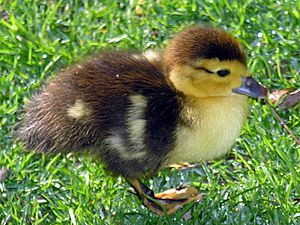 Ducklings are particularly vulnerable, since their inability to fly makes them easy prey not only for predatory birds but also for large fish like pike, crocodilians, predatory testudines such as the Alligator snapping turtle, and other aquatic hunters, including fish-eating birds such as herons. Ducks' nests are raided by land-based predators, and brooding females may be caught unaware on the nest by mammals, such as foxes, or large birds, such as hawks or owls. Adult ducks are fast fliers, but may be caught on the water by large aquatic predators including big fish such as the North American muskie and the European pike. In flight, ducks are safe from all but a few predators such as humans and the peregrine falcon, which regularly uses its speed and strength to catch ducks. Ducks have many economic uses, being farmed for their meat, eggs, and feathers (particularly their down). They are also kept and bred by aviculturists and often displayed in zoos. Almost all the varieties of domestic ducks are descended from the mallard (Anas platyrhynchos), apart from the Muscovy duck (Cairina moschata). The Call duck is another example of a domestic duck breed. Its name comes from its original use established by hunters. This was to attract wild mallards from the sky, into traps set for them on the ground. The Call duck has also received a place as the world's smallest domestic duck breed, as it weighs less than 1kg. In many areas, wild ducks of various species (including ducks farmed and released into the wild) are hunted for food or sport, by shooting, or formerly by decoys. Because an idle floating duck or a duck squatting on land cannot react to fly or move quickly, "a sitting duck" has come to mean "an easy target". 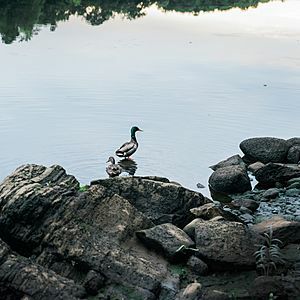 These ducks may be contaminated by pollutants such as PCBs. In 2002, psychologist Richard Wiseman and colleagues at the University of Hertfordshire, UK, finished a year-long LaughLab experiment, concluding that of all animals, ducks attract the most humor and silliness; he said, "If you're going to tell a joke involving an animal, make it a duck." The word "duck" may have become an inherently funny word in many languages, possibly because ducks are seen as silly in their looks or behavior. Of the many ducks in fiction, many are cartoon characters, such as Walt Disney's Donald Duck, and Warner Bros.' Daffy Duck. Howard the Duck started as a comic book character in 1973 and was made into a movie in 1986. The 1992 Disney film The Mighty Ducks, starring Emilio Estevez chose the duck as the mascot for the fictional youth hockey team who are protagonists of the movie, based on the duck being described as a fierce fighter. This led to the duck becoming the nickname and mascot for the eventual National Hockey League professional team Anaheim Ducks. The duck is also the nickname of the University of Oregon sports teams as well as the Long Island Ducks minor league baseball team. Duck Facts for Kids. Kiddle Encyclopedia.